The following information pertains to electronic Speed Controllers for brushed, DC permanent magnet (PM) motors without a speed feedback loop or open loop type. 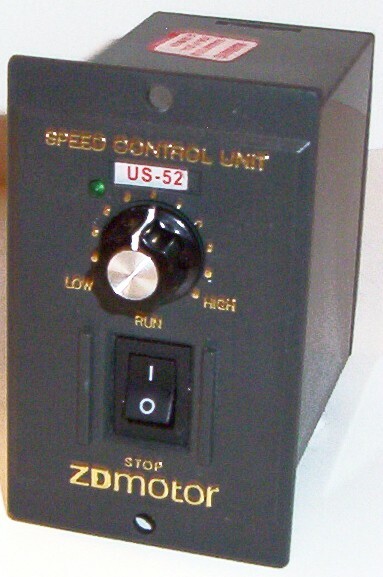 The most important criterion is to ensure that the current-handling capability of the speed controller is greater than or equal to the current drawn by the motor. For example, if the speed controller is rated at 300 Watts continuous, then the motor should not draw more than 300 Watts under its worst-case continuous operating conditions. To convert the wattage rating of a speed controller into the actual current (I) flowing through it, I = P ÷ E where P = Wattage rating of the motor and E = Supply Voltage. In the absence of this motor data, the safest and easiest determinant is to ensure the controller can handle the stall current of the motor. Stall current is the current drawn by the motor with the full voltage applied and the armature being stationary or prevented from rotating. In any case, the stall current should not exceed the peak current rating of the controller because that is generally the start-up current for a stationary motor. The controller should be able to withstand the peak or stall current for short periods. The period is determined by the ability of the controller to dissipate heat generated in its switching transistors. Current draw exceeding the peak rating of the speed controller may eventually result in damage to it. However, if that current exceeds the maximum current rating of the switching transistors then their destruction will be instantaneous due to the nature of semiconductor devices such as MOSFETs, and compromises in fuse selection. Fuses rarely blow quickly enough to protect against this kind of over-current event and as a consequence, adequate safety margins in selection criteria are always prudent. Always use fuse protection just adequate for the working current. For example, if the motor draws a nominal 9 amps, then try using a 10 amp fuse, not a 30 amp one. A bi-directional speed controller is necessary in applications where speed control of a motor in either direction is required. A neat way of doing this is to have the speed control knob with a 'centre off' position and clockwise knob rotation increases speed in one direction and counter-clockwise rotation increases speed in the reverse direction. It is necessarily more electronically complex than a unidirectional type and this is reflected in the higher cost. It is important to note that attempting a rapid change in direction of the motor, while it is rotating in the opposite direction with load inertia, will cause a current draw greatly exceeding the motor's stall current and commensurate with the armature speed. This is not recommended practice, however, it is possible to do this if the controller's capacity hugely exceeds the rating of the motor, such as using a 30 amp continuous controller and a 5 amp motor although under those abusive circumstances, the robustness and longevity of the motor and the power supply ought to be considered. 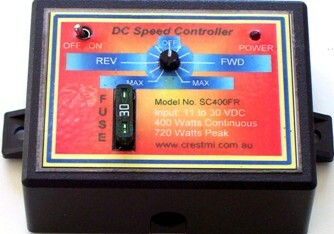 The efficiency of electronic speed controllers is due to the use of a 'chopper' or PWM (Pulse Width Modulated) circuit. The alternative to the chopper is voltage dropping through the introduction of circuit resistance. This is a grossly inefficient way to regulate voltage necessitating a physically large variable resistance capable of dissipating the waste heat energy. Not a practical solution in most cases and most certainly, a profligate waste of energy and resources. The switching frequency of the PWM may typically be around 400 cycles per second and the duty cycle is varied according to the desired motor speed. This simply means that the ratio of ON time to OFF time is varied depending on the setting of the control pot. The ratio can vary from zero% to 100%. Zero means that the voltage to the motor is zero or 'off'. Conversely, 100% means that the voltage to the motor is continuously applied as though the motor were connected directly to the power supply with no speed controller in the circuit. If say, 50% is selected, then the full voltage is applied for half of the cycle time and zero voltage is applied for the other half of the cycle time. The result is as though a voltage of half of the available supply has been applied. The formula to calculate the average voltage output applied to the motor, ignoring small intrinsic losses, is: Vout = Vsupply x (ton ÷ T). There are small losses inherent in PWM speed controllers due to finite transition periods from the OFF to ON and ON to OFF state along with the finite resistance of the MOSFET switching transistors. These losses are small indeed but become significant as the switching currents increase with high current motors. Consider the power dissipation required where 100 amps is flowing through a 0.002 ohm resistance. By ohms law, P = I 2 x R = 10000 x 0.002 = 20 watts of destructive energy. 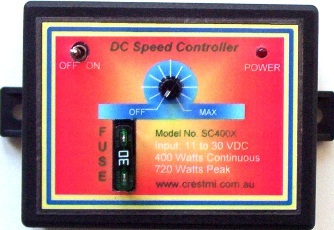 All our DC Speed Controllers are designed and manufactured in Australia and include a PCB mounted Blade Fuse and Holder and are repairable for a fixed price repair charge. Email us for details. The FR range features energy recovery or regenerative braking whereby any voltage generated by the motor in excess of the source voltage is returned to the power supply. 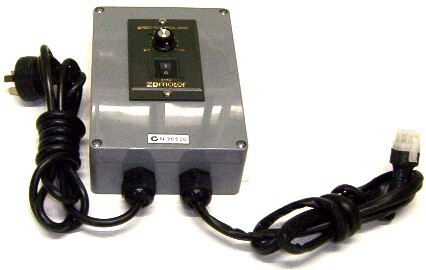 This AC Speed Controller is designed for use with our range of AC single phase induction motors. It has a continuous rating for motors up to 140 Watts with the start/run capacitor mounted externally or on the motor. It includes an ON/OFF switch and a speed control range for the motor (before gearing) from 90 RPM to 1350 RPM. The actual gearbox output shaft speed is commensurate with the gear-down ratio of the selected gearhead and is calculated by dividing the number of RPM by the gear ratio. For example: A 90 RPM motor speed with a 5GUK100F gearhead will yield a 0.9 RPM shaft speed. 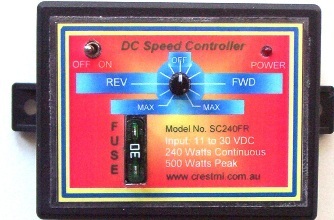 If you don't want to bother with enclosures or panel mounting and wiring but just want to simply plug the controller into a mains outlet and quick-connect the motor with the speed controller, add the Enclosed & Pre-wired Option. Your US22B will be installed in an ABS enclosure and wired ready for use. It incudes a 1.8 metre power lead and 1 metre of cable from the controller to the motor. If longer than 1 metre is required, add the additional length in centimetres. For example, if you require 2 metres, add 100 centimetres (1 + 1 Metre). If you require bidirectional speed control with the US22B, we can add a 3-position switch designated CCW-Off-CW or REV/Off/FWD whereby the direction of motor rotation can be reversed and the controller will control the motor speed in either direction. Select the bidirectional option EPWUS22BFR if required.